This dress was a very easy sew – I’d say it was about a 4 hour project. I didn’t make a muslin (as I don’t for knits.) What I do instead is change the order of sewing. I sew the shoulders together, set in the sleeves flat, and then sew the skirt pieces to the bodice, but I wait until the very end to sew up the side seams and the sleeve seam in one pass. That way if I need to make adjustments I won’t have any intersecting seams. I also baste the side seams the first time to check for fit. In this case I chose to take the sides in by 1/2″ total (making 6/8″ seams instead of 5/8″.) It actually fit before, but I wanted to make sure in case it stretched. The Sophia knit was again lovely. One caution – I found that with the dark color I needed to use a press cloth to avoid iron shine (I made my own out of a square of silk organza… it takes high heat well, but it’s see-through.) The pattern had ok instructions for knits, because it actually realized that it didn’t need a zipper! I don’t know why all the BMV patterns tell you to doublestitch your seams. I use a narrow zigzag on my regular machine. I rarely serge knits, I use my serger more for finishing seams than anything else. The pattern runs a bit short – I took a narrower hem than called for, and I like this length, but I’m used to patterns giving you more to play with. If I have any criticism of the pattern it’s the back – it looks ok, I suppose, but I feel that it should have less pleating, or that perhaps the pleating could be changed to gathers. I did not add the button tab, but it’s only decorative anyway. I couldn’t get mine to look even, so I decided it was better off without. It’s worth noting that the model in the photos I found of the actual Muse dress is standing mighty funny in the rear view, so I’d imagine the issue is with the design, not the pattern. It’s not a big deal to me anyway. It’s probably too warm for this dress today (it’s supposed to be in the mid 70s) but I don’t care – I have an evening rehearsal in a cold theater, so I’d rather be warm! 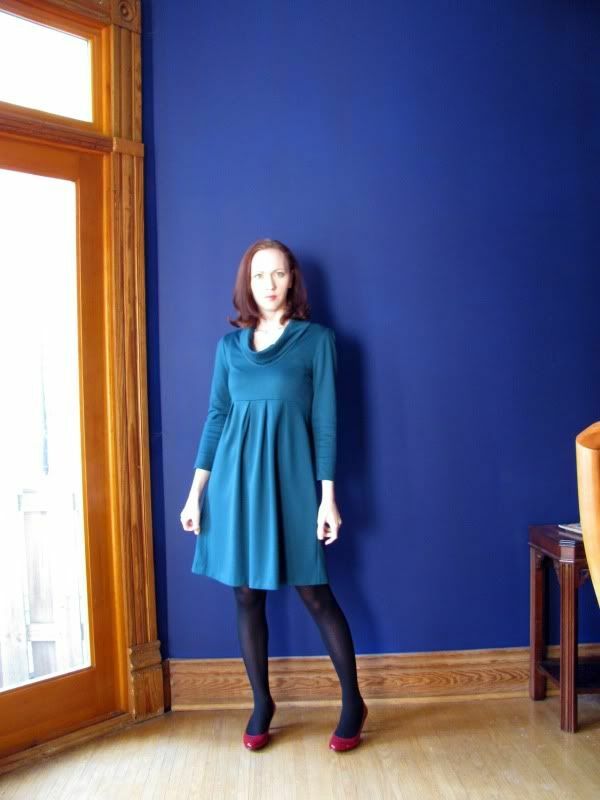 This pattern is really highly recommended – it’s a great dress for winter! What a pretty color on you and a really great look! Fantastic dress! Aren’t doubleknits the BEST for winter? You’re going to wear this a LOT, I bet! That looks great! I think gathers probably would have been a better fit for the back, but that’s not a major issue. Your version came out so lovely. That is a real cute dress! You look much better in it than the model does!! This dress looks great on you. I agree with the back of the dress. I think fewer gathers would be good but no big deal. Another winner for you. Hope to see something knit sometime. Another gorgeous (and very practical) dress. 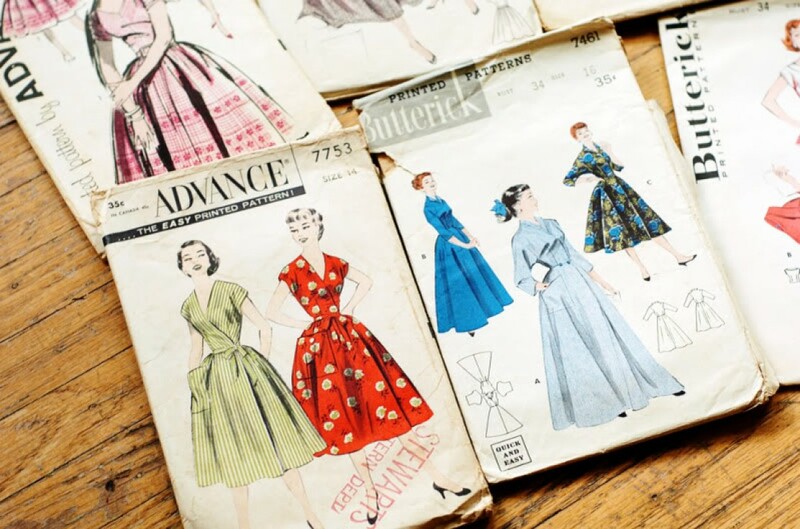 If only it took me four hours – rather than four months – to make a dress! It looks fantastic – the colour is perfect for you. I love an empire waisted dress too – they definitely suit your figure. Sweet! Can you make me one please?? And the shoes make the outfit. This is such a lovely dress on you as are all of your dresses. May have been a easy sew but looks just well made. What a pretty dress – I love the colour on you! Tres elegante. I especially like the color on you & your interesting accesorizing colors! I love reading that empire waists are controversial! Because some women feel they look pregnant wearing clothes with empire waists, or some crazy historical context I was previously unaware of? I love this dress! Looks so right for winter. Love that dress. The color looks great with your hair! I like this one! It’s perfect for winter. I’m not usually a fan of empire waists but this is a really sophisticated version! Pretty colour on you, too. You look terrific! What a fantastic color on you. Your dress turned out great and your review is very helpful. I just cut this one out and am getting ready to sew it and our tips will be quite helpful.